After introducing and fleshing out the characters, Hyde, Jekyll, and I is really turning up the comedy factor. While last week we learned more about Robin, this week was really Seo-jin’s time to shine. Their “sibling rivalry,” each finding ways to annoy and aggravate the other, is really entertaining. Seo-jin (Hyun Bin, Secret Garden) is completely trapped by Robin who threatens to reveal the truth about his identity if he hurts Jang Ha-na (Han Ji-min, Rooftop Prince). 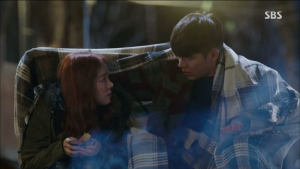 In a last ditch effort to regain some control, Seo-jin reinstates his old rules: he gets the day, and Robin takes the night. Apart from practical reasons, this also symbolizes the split Seo-jin is experiencing. Daytime is for schedules, work, organization and responsibilities, everything that Seo-jin clings to. Nighttime is for freedom, fun, spontaneity and troublemaking, which is Robin all the way. We can see the splitting theme in other areas, too. His house has secret rooms and hidden compartments that not even his secretary knows about. Even Seo-jin’s hair is always split perfectly in two. Seo-jin continues to change in these next episodes from a hermit to someone (almost) normal. Five years of shunning relationships has certainly taken its toll. He can’t even smile with feeling, much less express himself artistically as Robin does. 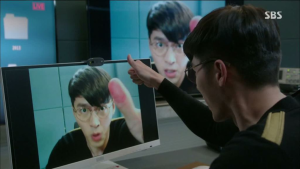 But even though his acting isn’t perfect, Seo-jin experiences freedom with his new disguise. As Robin, he can see a completely different side to Ha-na and the other employees; he can even do silly children’s games and drinking games. Wearing different “masks” for different situations is something most people do. Normal people are usually able to transition from “work mode” to “play mode” without much difficulty. People act differently when they’re with friends, coworkers or family because of different social expectations. But Seo-jin doesn’t have that ability to change and adapt; except for rare occasions, he has the same surly personality whether he’s with family, employees or strangers. But as Robin he is forced to try to show a different side. And, rather than just a random personality, Robin is something Seo-jin created after being kidnapped as a child. The trauma was further exacerbated by his father, who Seo-jin feels abandoned him in his hour of need. Because of this emotional pain, Seo-jin created someone who was never hurt. In a way, Robin can be seen as Seo-jin’s inner child or innocence that was taken away from him, but reborn in a new form. He can never get back that lost time, just like he hasn’t been able to reintegrate Robin. Instead, he wants to destroy Robin forever. And without that inner child, who can be silly and happy, Seo-jin has little chance of truly living; he’ll just be going through the motions. This is part of the reason why Ha-na is becoming someone important to Seo-jin. For the first time, he has someone who made him laugh and who cared about his well-being. He’s also seeing that she is more similar to him than he realized. She confesses that she tells her coworkers to believe in her and depend on her, but she feels afraid and alone. Seo-jin probably feels the same way when his parents tell him to go to the US. He feels that he has to take care of things, even though he’s afraid and unsure of what to do. But what really leaves an impression on him is seeing Ha-na completely fall apart in front of her attacker. 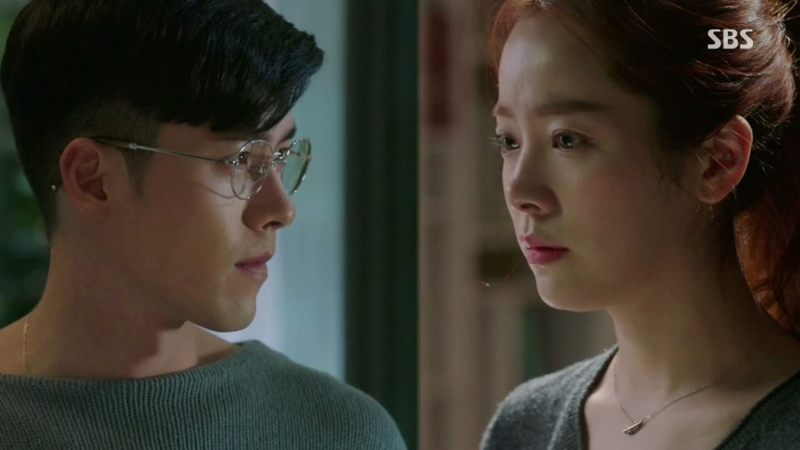 Seo-jin sees a part of himself in Ha-na, another person who is at the mercy of terrible memories. The series is doing a good job of moving things along. The attacker has already been identified (otherwise it would make the police seem completely incompetent). There are still unexpected, but relevant, surprises, such as the attacker running Ha-na and Robin off the road. There are some awkward plot choices though. Seo-jin was forced to stay at the MT meeting because of what had to be the lightest “snowstorm” ever. Even more amazing, the circus troupe’s cheap van was able to get through but not the police. But Hyun Bin’s acting makes up for those awkward writing choices. Seeing him play Seo-jin who’s pretending to be Robin was just great to watch. It’s a real credit to his skills that we can recognize Seo-jin even when he’s trying to be someone else. Now that Seo-jin has given Robin a taste of his own medicine, it will be fun to see how Robin will get his revenge. Crazy contracts? Embarrassing publicity students? You never know with this series.